Buck Buckley's Total Basement Finishing (TBF) is the registered basement remodeling dealer of the TBF remodeling system in Illinois, Greater Kenosha, WI and surrounding areas. Norway Built has 30 years of remodeling experience, specializing in basement finishing and kitchen and bathroom remodels. They serve customers in Downers Grove, Aurora, Naperville, Elgin, Plainfield and St. Charles, Illinois. Schedule a free estimate with them today. Your satisfaction, health, and safety are our #1 concern. That's why we aim to eliminate mold, moisture, and mildew growth in every Illinois basement under our care. When we're finished, your basement will be drier, warmer, and cozier than ever! Our work comes with a 50-year-mold-and-moisture warranty. Whether you would like to transform your Illinois basement into a playroom for your children, a game room for adult gatherings, a personal gym, or even a second kitchen, we can help. Our experienced basement contractors use only the highest-quality materials when remodeling or refinishing your basement. We take great pride in our detailed craftsmanship, and guarantee that you'll be more than satisfied with the results. Thorough presentation and no push to buy; neatness and everything was very business like. Woods knows their stuff! Absolutely no complaints! Carolyn and Ross from Evanston, IL wanted to turn their basement in a fun family room. A place to entertain their family and friends. They also wanted to make sure they did it right from the beginning. If they were going to invest in a finished basement, they wanted it to be a space that they will be able to enjoy for as long as they live in the house. They didn't want to have to refinish it again if there was ever a water problem. For that reason they chose Buck Buckley's Total Basement Finishing. They had learned about their 100% waterproof basement finishing products during a home show and were pretty much sold on the spot. From that point on, the entire experience they had with the company was extremely positive, including the installation process. "Once we started it was a pretty quick process. We worked with Dan and he came even on the 4th of July weekend, so we were really impressed with that! They got the job done really quick and we were able to enjoy our basement!" -- explains Carolyn. Last June, we got a very hard rain and I didn't realize that our window well was improperly installed so our basement flooded. We did have to rip out our carpet so when a contractor came in to do the removal, he was ready to also rip out the bottom few feet of our walls. I was so happy that I got to tell him, "oh no, you don't have to do that with these walls, they may look like drywall, but they aren't, they are completely waterproof and there is absolutely no reason to rip these walls out!" The people at Woods are EXCELLENT! I was very impressed with products, presentation, and just personnel. It is a excellent solution to my basement needs. With years of training and experience, our Illinois basement finishing contractors are some of the best in the nation. We work within your budget to turn your basement remodeling wish list into a reality. 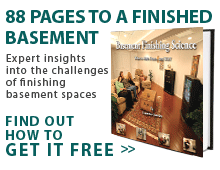 Are you ready to make a smart investment in your home by refinishing your Illinois basement? If so, contact one of our basement contractors today to schedule your free basement inspection and receive a remodeling quote. Due to a high volume of requests, we have expanded our Illinois network of basement finishing contractors to include areas like Chicago, Rockford, Aurora, Springfield, Naperville, and Peoria. If your basement is wet, call the company with a proven track record of more than 35 years to keep it dry. Basement Systems has developed waterproofing products and methods that are the envy of the industry – and that have satisfied hundreds of thousands of homeowners throughout the United States, Canada, the United Kingdom, and Ireland. As a Basement Systems dealer, we can provide a permanent solution to your basement waterproofing problem and will back it up with a lifetime, transferable warranty. A wet basement is not a good thing. It wastes valuable living space, damages your house, ruins valuable stored items, and even pollutes the air you breathe. "Very good people, product and process from beginning to end." "We have worked with others, But these are the best!" "Finding out that my damaged 3 season roof could not be replaced, it was..."
Finding out that my damaged 3 season roof could not be replaced, it was repaired instead. Zach set up a meeting to discuss my options. Very professional and honest recommendations. The roof was repaired and the technician did an excellent job. Thank you. "Buck Buckley's Total Basement Finishing is topnotch! I am completely..."
"We have been working with qualified borrowers for over 3 years who have..."
We have been working with qualified borrowers for over 3 years who have chosen Buck Buckley's Total Basement Finishing. Buck Buckley's Total Basement Finishing and all their staff are very professional and they put the Customers first.It is really the only company who does basements to work with! We here at Admirals Bank make it easy for their clients to afford the basement of their dreams. "Unique, liked the products demonstrated"
"We went with Buck Buckley's Total Basement Finishing because we were..."
"The basement looks awesome. I really like that they put a thermastat down..."
"I was very surprised at the quality of the product when I saw it in..."
Flooring that is able to survive water. Basement drywall is already cut and would like a waterproof fix for the bottom portion of the walls. Looking to have our basement ceiling redone. Looking to finish our basement. We have a basement we'd love to finish but are unsure if it's possible or not. We'd love to have someone come by to take a look and give us feedback/estimate. Would like a quote for finishing an entire basement. Finishing a 1100-1200 sq ft basement. Recent water damage has required a remodel. Also have a bedroom and bathroom in basement that will be redone as well as adding a small workshop. Want estimate to complete basement finish. Comment: Flooring that is able to survive water. Comment: Basement drywall is already cut and would like a waterproof fix for the bottom portion of the walls. Comment: Looking to have our basement ceiling redone. Comment: Looking to finish our basement. Comment: We have a basement we'd love to finish but are unsure if it's possible or not. We'd love to have someone come by to take a look and give us feedback/estimate. Comment: Would like a quote for finishing an entire basement. Comment: Finishing a 1100-1200 sq ft basement.